Diving into the year without a marketing plan is a setup for disaster. Arming yourself with a marketing strategy including a solid content calendar is not just good business – it’s imperative for success. A content calendar is one of the first steps in putting your overall plan into action. Don’t know how to get started? Start with what you already know. There’s an old saying: To see where you’re going, you have to look at where you’ve been. Before you start putting together the content calendar, do a content audit of past marketing projects and pay attention to the timing of successful elements. Did something not work? Strike it from the list. Also look at what themes were discussed (i.e. sales, product lines, customer awareness, links to interesting articles), and take this into account when putting together the current marketing/social media content calendar. The other benefit to looking to the past is finding older content that can be refreshed or updated. If you decide to publish or post on weekends, these relatively low activity times are perfect for recycled content. But remember; there is a difference between refreshed and repetitive content. If you decide to add past published work to your calendar make sure it’s at least a few years old – not last month’s. Before putting together your content calendar, have your specific marketing goals in mind. Look back to your marketing plan and make sure the content reflects the goals outlined in that original strategy at all times. These goals should include how often you would like to post or the responses generated from each element. Also, something to keep top-of-mind is your target audience. All activities have to come back around to the target consumer. Content calendars can be set up for any amount of time, but most are designed for one year. As always, track the success (or lack thereof), of each element, so adjustments can be made to the calendar as the year progresses.If by the time you put together the whole year you feel overwhelmed by the amount of posts and tweets, remember that your content doesn’t have to necessarily be original. There’s nothing wrong with retweeting something you think your audience would benefit from or writing a blog post about an interesting article. As long as you cite the source properly, these elements can add more dimension to your marketing strategy. Holidays are of utmost importance to your content calendar. Make sure you make note of all days that are important to your business including Cyber Monday, special sales or promotions, and any launches. Secondly, include all days that the office will be closed, so you know to work ahead and make special adaptions if any posts need to be scheduled at special times. The content calendar is a great tool for bringing the entire marketing team together. Even if the marketing manager is the only one authorized to make changes to the master document, the rest of the team should have access to at least view it. That way everyone is working toward the same goal and knows exactly what is happening when. Since the content calendar is a team effort, it doesn’t hurt to contact other departments that work closely with marketing, such as sales. They may be able to offer valuable insight as to what projects they’re working toward that cross into the marketing territory. If these are implemented into the content calendar at the beginning stages, there are fewer surprises and missed opportunities. Using a simple spreadsheet (like in the example above), is a great beginning tool, but for more complicated strategies you’ll need something a little more functional. Hiring a company like Milgrom Marketing not only gets your plan started from a content perspective (SEO, social, media, video, etc. ), but also can point you toward the right tools for your specific needs. Just like a marketing plan, the content calendar is never static. Think of your content calendars as living, breathing entities; they can change at any point and need to be looked after to function properly. One best practice is to review your content calendar at the end of each week to see what’s coming up and what may need to be changed. This way you’ll know basically what to expect over the next week and the opportunity for missing any important dates or elements is greatly reduced. Quarterly content calendar team meetings are a good habit to get into as well. 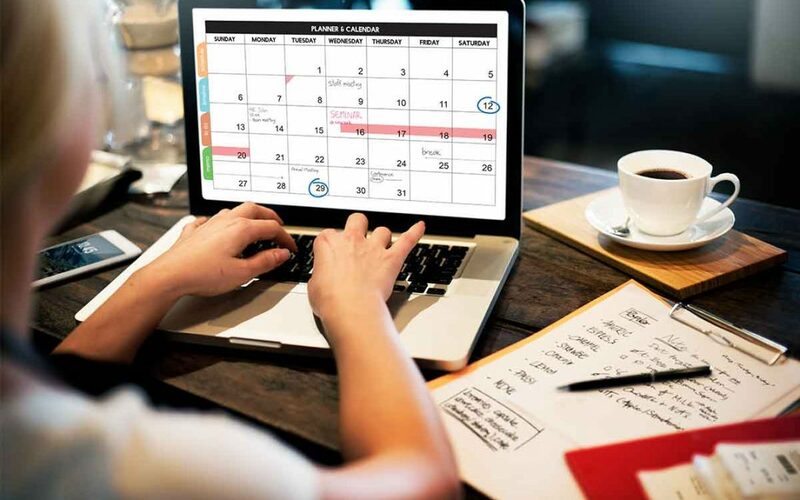 Not only do content calendars give you a full view of all marketing strategies, but also keeps your entire team on the same page, and is a great tool for tracking and avoiding any repetition. Without a content calendar, you can’t see where you’ve been, what you’re doing or where you’re going. So, keep your eyes on the prize and your content calendar close by.